F/15, Bldg. C, 19 Xiaoying Rd. 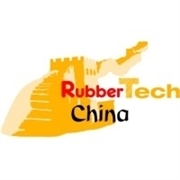 RubberTech China is an international trade fair for rubber manufacturing and rubber processing. It takes place once a year in Shanghai and has established itself as the leading exhibition for rubber technology in Asia since its foundation in 1998. International exhibitors show the full range of rubber machinery, rubber chemicals, rubber raw materials and rubber products. The visitors which are exclusively experts and professionals will find comprehensive information on the latest developments, trends, products and services from different areas of the rubber industry. The Rubbertech China is the ideal communication and information platform of the industry and allows international exchange of knowledge regarding the latest technologies and in terms of future perspectives and solutions for the industry. The fair is held in conjunction with the fair "Reifen China", the international tire fair in Asia. By combining both fairs the entire value chain of the rubber and tire industry is presented, which leads to enormous growth and development potential for national and international companies.